Thibaut Courtois has rejected Chelsea's opening offer of a new contract but both parties hope to agree a new deal despite interest from Real Madrid, Goal understands. Courtois, who is currently on £100,000-a-week, wants to double his salary to £200,000-a-week and is hopeful an agreement can be reached before the start of the new season. Chelsea's first offer was discarded amicably but talks are set to resume soon. Madrid are not expecting the Belgium international to become available during the current window despite their attempts to convince him to move back in February. Los Blancos are still keen to secure an upgrade on Keylor Navas but have been knocked back in their pursuit of Courtois and Manchester United's David de Gea and appear set to continue with their current No.1 in 2017-18. Gianluigi Donnarumma could also be an option for Zinedine Zidane's side but that deal will be far from easy despite the AC Milan wonderkid's refusal to extend a contract that has one year left to run. 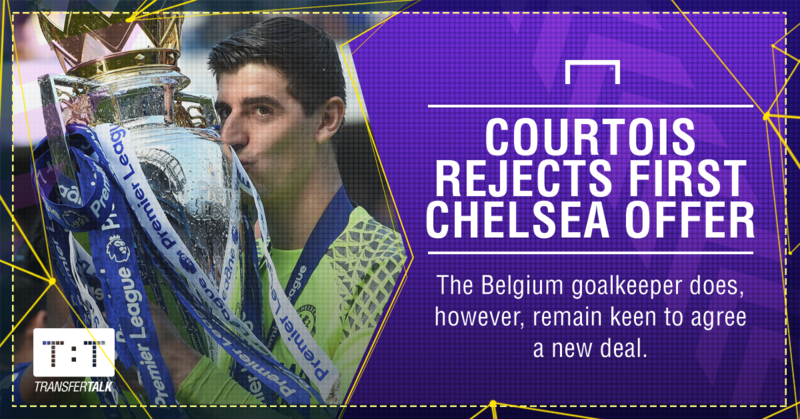 Courtois has two years left on his current terms at Chelsea and he will join up with the Blues for pre-season training in the second week in July. Willy Caballero is expected to join the club on a free transfer from Manchester City to replace departing backup Asmir Begovic, who has officially left the club in a £10 million deal that will take him to Bournemouth. Third-choice stopper Eduardo, meanwhile, has penned an agreement to remain at Stamford Bridge for another year. Courtois won the Premier League's Golden Glove award for 2016-17 after keeping 16 clean sheets as Chelsea won the title. He is now a two-time English champion and has also won league titles in Spain and Belgium.